We are fully equipped to handle and process bulk mail and we have the expertise to ensure that your mailing will always meet the postal requirements. 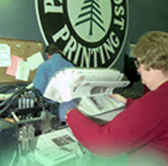 We offer you state of the art ink jet labeling as well as the traditional application of paper labels. We can also provide you with a mailing list and customize it to your needs. Our VideoJet 4000 inkjet equipment can be used in conjunction with our GMA inserter or it can be used as an offline device that will output directly from your electronic mailing list with efficient, high speed sortation. Traditional paper labels can also be applied with our Cheshire labeling equipment. We can handle 2nd and 3rd class mailings of any size to any location. We can also handle your list maintenance, accurate preparation of your postal paperwork, and delivery to the post office(s) that will allow you to achieve the lowest possible postage costs.